Offer Terms: Must accept bonus when depositing. Bonus of 200% on min deposit of £10, max £25. Any winnings available to withdraw immediately, bonus never available to withdraw. Bonus expires on account closure. Tombola Bingo is unlike any other online bingo site, and uses it’s own proprietary software. The site was launched in 2006, and is without a doubt one of the best bingo sites around. Before they transitioned over to Gamesys, Tombola provided the bingo software to Sun Bingo and News of the World Bingo, the latter of which is now defunct, so that meant that Tombola Bingo are now the only site left using this very unique software. Tombola PLC are registered in Gibraltar, and the site is licensed and regulated in Gibraltar and the UK. The site itself is so classy and stylish. It has super HD images and graphics, and the overall feel is something of very high quality. You’ll find a really slick and beautifully designed layout, that’s fresh and modern in colour and so easy to use. It definitely benefits from being an exclusive site, as everything is kept up to date and never feels old or tired. One of the most unique features of the site is the absence of slots and scratch card games. It means the primary focus of the site is on its bingo offerings, which may or may not appeal to you as a player. The bingo offerings are varied enough to keep you entertained however, so there’s plenty of choice to keep you busy. You’ll find all the games here are completely exclusive, so they can’t be found anywhere else online, and there’s options of 50, 60, 75, 80 and 90-ball games as well as unique specials such as bingo Roulette, Pulse Bingo, Hamster Race and Rollercoaster bingo. All games are variants of bingo, but each offers a comepletely different gaming experience. The popularity of the site is no doubt also due to the fact that Tombola hold such a strong focus on its own players and community. They really like to look after their players, and offer constant rewards, bonuses and promotions throughout. The Tombola Bingo welcome bonus is really fantastic. Click on the link at the top of this page for more details. Terms and conditions apply, and all players must be aged 18 or over. Other promotions are updated regularly, and can vary from season to season throughout the year! Stars is a fantastic free game, which has prize pots of to £30,000 in cash. Head on over to the Stars room for this game, and it won’t even cost you a penny to play. Join in the fun on the 80-ball game bingo Brunch. There’s guaranteed full house prizes of £250 per game, taking place Wednesday to Friday between 10:30am and 12pm GMT. You can also invite your friend’s to the site with a free £5 bingo bonus, and in return you’ll gain £20 yourself when they deposit their first £20. Tombola Bingo runs on its own unique bingo software, therefore providing its players with a completely unique experience. You will find so much variety of bingo at Tombola, including variations on 50, 60, 75,80 and 90 ball games plus lots of bingo specials to offer something a little bit different. The platform hosts more classic style games alongside newer more modern styles like bingo Roulette, Hamster Race, Rollercoaster bingo, Cinco bingo, Pirates and Lucky 7. All of these give a twist on bingo and are more hybrid bingo/gaming options! They offer something different and fun as the site doesn’t host any slots or casino games. Cinco bingo is a card based game, so simply match up the cards and win up to £20,000. Bingo Roulette mixes up classic bingo in more of a casino style. Place your chips and get spinning for jackpots of up to £10,000! Join the Pirates and set sail for just 10p a card on this fun game, and Hamster Race offers up Tombola Bingo’s very own race track. Place your bets from as little as 25p, and cheer along those little furry friends. Once you have chosen your preferred game, you’ll then have the option to change the colour of your dauber, aswell as options to change certain graphics and sound. As mentioned before, the primary focus at Tombola is on its bingo offerings, and the other games available are still based around bingo and daubing. You will find variations on this on the previous mentioned games however, so there is always something to keep you busy at Tombola. If you’re after some specific slots or casino and table games, you can head on over to the siter site Tombola Arcade. Here you will find even more excusive and exciting games to play. Please read all terms and wagering requirements upon registration, as details are always subject to change. Wagering requirements must be met before cash withdrawals can be made. 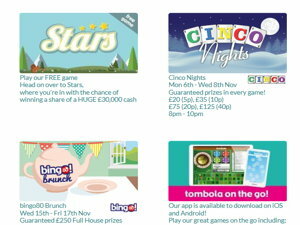 Tombola Bingo is a completely unique and family owned site, offering a totally exclusive gaming experience for all budgets. The sites been running now for over 10 years and has built up a fantastic army of loyal followers. The unique games and promotions can’t be found anywhere else, and you’ll get a really intimate and friendly feel throughout. If you’re after a site that offers exceptional gaming with that real perosnal touch, then take a spin on the fantastic Tombola Bingo.